Emory Students and Workers in Solidarity Turns up The Heat. The past month has shown a flurry of organizing from Emory University Students and Workers in Solidarity (SWS). On April 5th SWS hosted a forum titled "What is a Union?" Elizabeth Hennig a freshman at Emory University and member of SWS moderated the forum. She posed questions to the panelists and they answered according to their experience. The dialogue included multiple perspectives on the development of the labor movement in the United States to concrete organizing battles both past and present for dignity and respect on the job. The speakers weaved a tapestry of experience, concrete struggle, power, and wisdom for a room of students normally isolated to academic exercise. The audience asked the panelists questions to round up the night. On April 11th (one day before the arraignment of the 7 arrested students) SWS held a press conference on the Emory quadrangle where 7 students were arrested while sitting peacefully protesting unequal working conditions on campus. Students facing up to one year in jail articulated their stance: Students were arrested because the Emory administration did not agree with their political message. Instead of arresting peaceful student protestors, Emory should take steps to stop the two-tiered labor system on campus where contracted workers are treated as second class citizens. 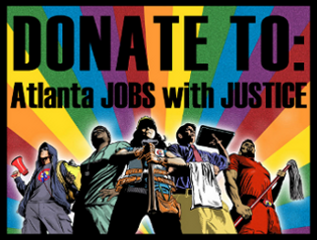 Contracted workers do not receive free MARTA passes like all other full time campus workers, do not receive any tuition subsidies for their children to attend Emory like all other full time campus workers and have faced aggressive intimidation by management when they try to organize. Creative Loafing Coverage - "Emory students face charges for congregating where students congregate"
April marks the month where thousands of prospective Emory students come to visit campus with their families. These campus visits are critical regarding the prospective student's decision to attend Emory or not and therefore Emory desperately wants to portray itself as a perfect institution of higher learning. Keep in mind that each student will end up paying Emory University about $200,000, or not. Emory SWS has been leafletting prospective students and their families with pertinent information regarding the prosecution of its own students and the labor inequalities on campus. Prospective students and their parents are eager to learn more about Emory than what the admission's office wants to tell them. Where: In front of Senator Balfour's $29,000/year condo: Spire Condominiums 860 Peachtree St. NE. Balfour was the author and sponsor of SB 469 which sought to criminalize actions like protests in front of private residences. Ethics complaints have been filed against Balfour for his unscrupulous spending of public monies. News of the 1st amendment crushing, anti-worker SB469 came out just over a month ago. Word spread like wildfire amongst Georgians of the need to mobilize. Despite the seeming unconstitutionality of the bill it quickly became apparent that Senator Balfour and his corporate backers ALEC (American Legislative Exchange Council) and the Chamber of Commerce would stop at nothing to ram the bill through. The bill was pushed through the senate with no debate allowed on the controversial bill, a rare and undemocratic move. Thousands of everyday Georgians including trade unionists, civil rights leaders, community members, people of faith rallied at the capitol in clear opposition of the bill. Civil rights leaders loudly proclaimed that our community would put our bodies on the line to stop this bill. In response, Balfour pushed harder, leveraging his deep monied connections to hold a back door Industrial Relations Committee meeting on SB469 giving no public notice to slide the bill through to the house and again trying to bypass our democracy. This blatant attack on free speech, working people and democracy galvanized Georgia to resist. The tea party came out in support of organized labor against the bill. Dozens were prepared to commit civil disobedience. The overwhelming pressure forced cracks in Balfour's ranks, the alliance forged between labor and the Georgia community stopped the bill in its tracks. The clock struck midnight on the last day of the legislature and the bill had been killed by a historic labor and community alliance. This victory marks beginning of the 99% spring offensive. Everyday Georgians will gather in-front of Balfour's Atlanta condo to announce our historic victory and plans to go on the offensive to take our state back from corporate giants and the politicians they own like Senator Balfour. As part of the 99% Spring over 100,000 community members in our state and country will be trained in collective non-violent action and people's economics to take our economy and government back from the 1%. Find a training near you Here.